I hope that you're enjoying Holiday Side Dishes Week as much as I am! 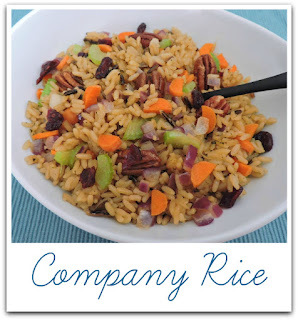 For my second recipe, I made Company Rice from Taste of Home. Since I changed my eating habits last year, I have been eating significantly more rice than I ever have in my life. It's really been challenging to find ways to change it up! I used Bemuda onion because it was what I had on hand, plus it added a pretty color to the dish. I changed the ratio of long grain to wild to use up what I had in the cabinet. I absolutely loved all the flavors and textures of this one! Thank you so much to Jayne S. for sharing her recipe! Be sure to go and see what the other amazing #HolidaySideDishes the #FestiveFoodies have made today by clicking the links at the bottom of the post! In a large saucepan, saute the celery, carrot and onion in butter until tender. Stir in broth and wild rice. Bring to a boil. Reduce heat; cover and simmer for 25 minutes. Add long grain rice; cover and simmer 20 minutes longer. Stir in cherries; cook until the liquid is absorbed, about 5 minutes longer. Just before serving, stir in pecans. I love the bits of dried fruit in there! We eat a lot of rice around here too Jolene. Always happy for another recipe.